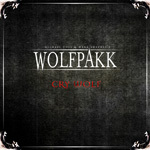 Mark Sweeney (ex-Crystal Ball) and Michael Voss (Mad Max, Casanova) return with their Wolfpakk project, and their second release, Cry Wolf. As before, with their self-titled debut, the album is an ensemble project with guest guest musicians offering their talents. Mostly it's a large assortment of vocalists including Amanda Somerville (Kiske/Somerville), Ralf Scheepers (Primal Fear), G�ran Edman (Ex-Yngwie Malmsteen) and others. You can see the complete lineup and credits for each song here. Wolfpakk: Voss and Sweeney and furry friends. Again, similar to the first work, the music is largely melodic hard rock and metal. Most songs have a strong rock groove driving them like Dark Revelation, A Matter of Time, and the quite catchy Pressure Down. On the more metal side of things is The Beast In Me, clearly speed metal. 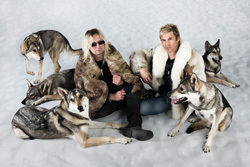 Curiously, according to the credits, only two songs have keyboards, but they're provided by seem well-known talent: Don Airey (Deep Purple) on Cold Winter and Tony Carey (Ex-Rainbow) on the Rainbow cover Run With The Wolf. (He played keys on the original version). It's quite good. The former song, Cold Winter, is the closest thing to a ballad and features Somerville. Finally, the title track is the longest here, featuring Blaze Bayley on vocals, and pursues more power metal than simple hard rock. Cry Wolf is another good effort from Mark Sweeney and Michael Voss and the Wolfpakk team, even though they seem in their comfort zone and not really pushing too many boundaries.